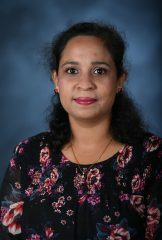 Dr. Parveen’s research is focused on identifying and characterizing the enzymes from different secondary metabolite pathways using genomic, molecular and biochemical approaches. These enzymes are mostly the proteins involved in the productions of secondary metabolites of medicinal importance. The major goal of this project is to characterize the novel enzymes and new compounds of therapeutic importance. Her second project is identification and authentication of botanicals using different molecular markers and DNA Barcoding approach. The DNA barcodes or Molecular markers were developed for the rapid identification of medicinal plant species that are used as herb ingredients in popular medicinal herbal formulations and dietary supplements.